In February 1856, Cardinal Alessandro Barnabo, the Secretary of the Sacred Congregation of Propaganda Fide asked Mgr de Marion Brésillac to found a missionary congregation to assist him in his new work in West Africa and to ensure stability and continuity. On 8 December 1856, on the hill of Fourviere – at the shrine dedicated to Our Lady in Lyons, France, Bishop de Brésillac and six companions established the Society of African Missions (SMA). The special aim of the new Society was the evangelization of the most abandoned people in Africa and the formation of an indigenous clergy to care for the newly-established communities – thus enabling the missionaries to move on to evangelize others who were still in need. The Irish Province members accounted for 206 of the 901 members. Following the death of 6 priests during 2011, the Irish Province now has 3 brothers, 193 priests and 4 bishops. One of those priests, Fr Liam O’Callaghan, celebrated the 70th Anniversary of his Priestly Ordination at a Mass in the SMA House, Blackrock Road, Cork. 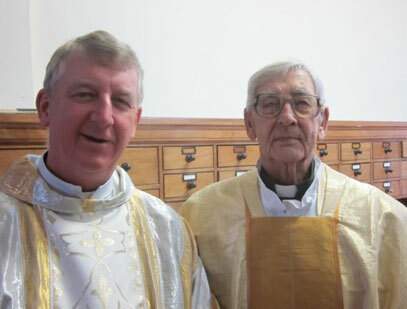 Fr Fachtna O’Driscoll led more than 60 priests in a Mass to celebrate the double feast – the 155th anniversary of the SMA foundation in Lyons, France and Fr Liam’s Platinum anniversary. Read more here. The homily delivered by Fr Eddie O’Connor SMA, who worked for some years with Fr Liam in Nigeria, can be read here.